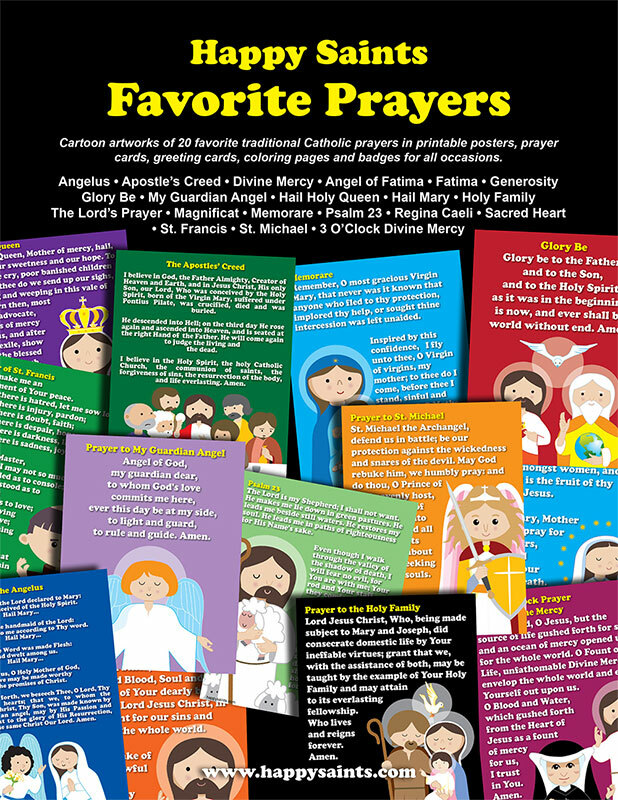 Cartoon artworks of 20 favorite traditional Catholic prayers, in printable 8x10 posters, prayer cards, greeting cards, coloring pages and badges. Featuring Prayers of: Angelus, Apostle’s Creed, Divine Mercy, Angel of Fatima, Fatima, Generosity, Glory Be , My Guardian Angel, Hail Holy Queen, Hail Mary, Holy Family, The Lord’s Prayer, Magnificat, Memorare, Psalm 23, Regina Caeli, Sacred Heart, St. Francis, St. Michael and 3 O’Clock Divine Mercy. Get the PDF eBook now!